All Natural Dog Food Formula with Four High Quality Meat Meals: Chicken, Turkey, Lamb, & Fish, combined with Fresh Lamb — Dogs Love the Taste! Grain FreeGrain Free Formula with 80% Meat Protein and 20% Vegetable and Fruit Protein Provides Wholesome Nutrition and Increased Energy Levels. CANIDAE® Grain Free All Life Stages formula meets the AAFCO Dog Nutrient Profiles for all life stages. 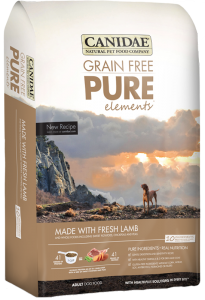 – Excellent Palatability – Dogs Love CANIDAE®!